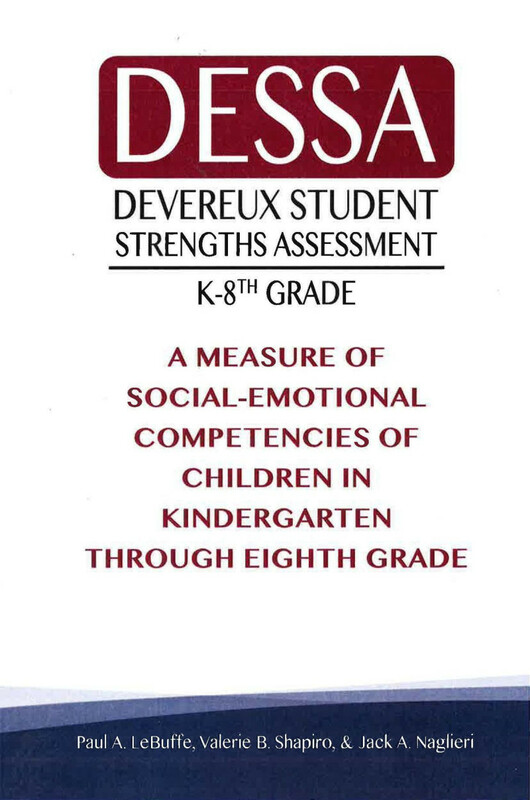 The Devereux Student Strengths Assessment (DESSA) is a behaviour rating scale that is completed by parents and/or teachers/after-school providers which provides an assessment of social-emotional competencies related to resilience in children aged 5–14. The DESSA is used to assess children’s protective factors and identify the social and emotional strengths and needs of a child. Results of the assessment should be used to plan for children's support in their growth and development of social and emotional health. Raters generally fall into two categories: 1) Parents, Guardians and other Adult Caregivers who live with the child, and 2) Teachers, after-school program staff, or other professionals who interact directly with the child on a regular basis. The assessment items take approximately 10 minutes to complete. Social-Awareness (9 items): A child's capacity to interact with others in a way that shows respect for their ideas and behaviours, recognizes her/his impact on them, and uses cooperation and tolerance in social situations. Self-Management (11 items): A child's success in controlling his or her emotions and behaviours, to complete a task or succeed in a new or challenging situation. Goal-Directed Behaviour (10 items): A child's initiation of, and persistence in completing, tasks of varying difficulty. Relationship Skills (10 items): A child's consistent performance of socially acceptable actions that promote and maintain positive connections with others. Personal Responsibility (10 items): A child's tendency to be careful and reliable in her/his actions and in contributing to group efforts. Decision Making (8 items): A child's approach to problem solving that involves learning from others and from her/his own previous experiences, using values to guide action, and accepting responsibility for decisions. Optimistic Thinking (7 items): A child's attitude and confidence, hopefulness, and positive thinking regarding herself/himself and her/his life situations in the past, present and future. Also available: The DESSA-Mini is a screening tool, providing a brief summary of children's current overall social-emotional competence to determine if additional skill development should be a priority.